Stort bredt og komfortabelt sæde til fører (med ryglæn) og passager. Ryglæn kan klappes ned når du skal på MC'en. Suzuki Boulevard C90 & C90T 2005-2009 Wide Vintage Two-Piece with Driver Backrest, No Studs, No Conchos Sold as a complete three-piece set including solo, removable driver backrest and matching passenger seat. Featuring several design improvements over the stock seat, the 17.5" wide, deeply pocketed driver bucket sits you at the ideal cruising angle. The driver's back is well supported by the nose of the passenger seat that extends forward to create a full 8.5" high backrest. The entire 13" width of the comfortable passenger seat is fully supported by Mustang's unique internal steel support wings. 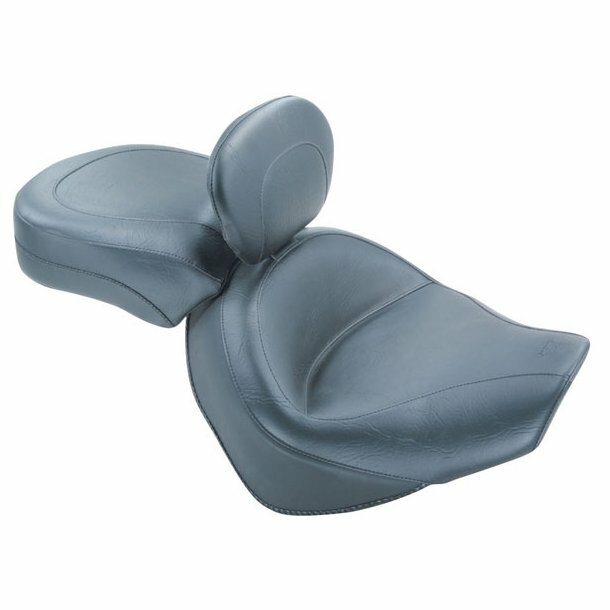 The built-in driver backrest offers more features than any backrest on the market.